The usage of emoji continues to rise as more and more people get connected to the internet to communicate and interact with other people. First gaining widespread use in Japan, emoji is now spreading all over the world. Basically ideograms and stylized smileys, emoji have jumped from Japanese electronic messages to global usage through phones like iPhone, Android and Windows Phone. They're also widely used in a lot of emailing services and social media sites. 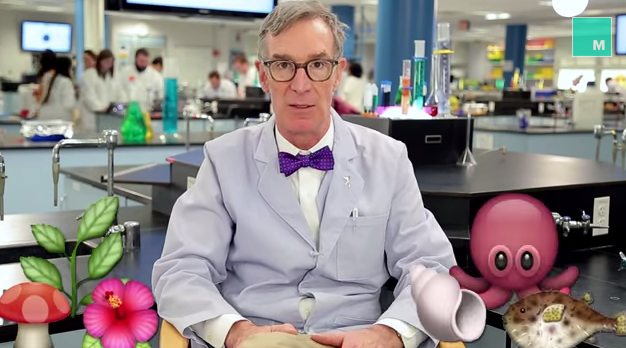 Bill Nye, the American science educator and author more well-known for his nickname The Science Guy has teamed up with the technology company General Electric to create what they call an Emoji Table of Experiments. In the table of experiments, you can find several science tutorials like igniting lead, needle in a balloon, bubbles & dry ice, and so much more. Check out the tutorials here. In the following video brought to you by Mashable, Nye explains the basic concepts of the theory of evolution using emoji. He explains how every living thing on earth evolved from simple molecules over millions of years to their current form. Bill Nye has recently written a book which was published last November by the St. Martin's Press. Called Undeniable: Evolution and the Science of Creation, the book was inspired by Nye's controversial debate with Young Earth Creationist (YEC) Ken Ham in February of this year.